Island staff rescues TAR Park from ‘ghost net’! Home/Conservation, News/Island staff rescues TAR Park from ‘ghost net’! A ‘ghost net’ is defined, as a discarded fishing net that continues to fish, and the effects are so destructive to the marine ecosystem. During a fun dive at one of our favourite reefs in the TAR Park, two of our PADI professionals came across an enormous illegal fishing net smothering fragile corals and entangling marine life. The following morning, a team of certified divers of our island staff returned to the area to remove it. It is a passionate common cause amongst divers to preserve and protect the marine environment and our island staff feels particularly protective of the local environment. 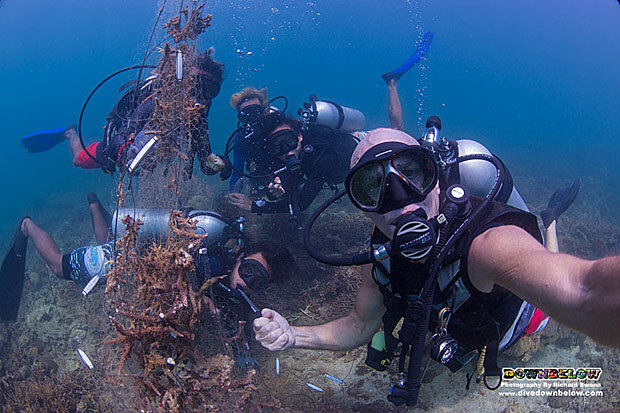 For the past decade, our team has recovered over 100 illegal fishing nets in the parameters of TAR Park, and whenever possible Go PRO internship candidates as well as our local Go PRO interns will participate for the practical experience of conservation, which is one of many duties expected of the PADI professional. Contact our Head Office for more information on how to volunteer your efforts toward the conservation of our natural world! By Joanne Swann|2014-09-29T13:48:45+08:00September 26th, 2014|Conservation, News|Comments Off on Island staff rescues TAR Park from ‘ghost net’!